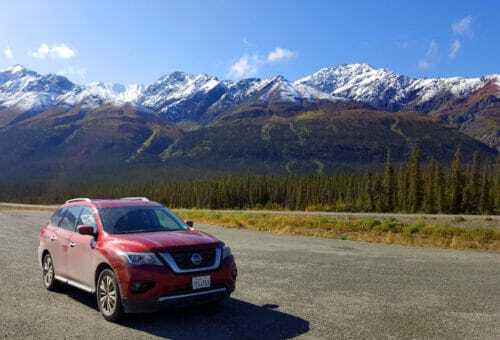 How do you begin to share the awesome experiences of an epic road trip – from LA to Alaska and back? One post at a time, I guess! And I’m going to start with what was one of the highlights of our trip: The Kenai Fjords National Park Cruise with Major Marine Tours! 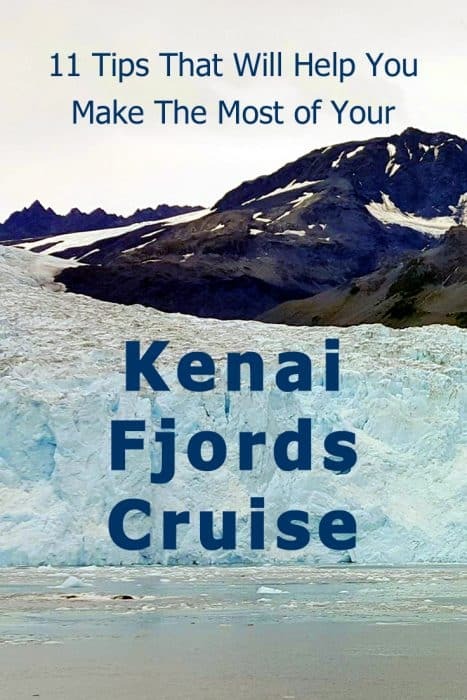 I’m going to share with you stories and photos from our Voyage on the Sea as well as some practical tips that will help you make your own Kenai Fjords Cruise a success. 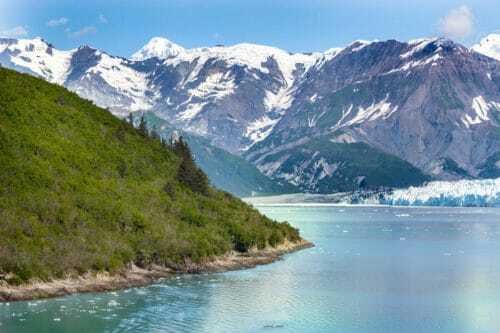 Why a cruise in Kenai Fjords National Park? 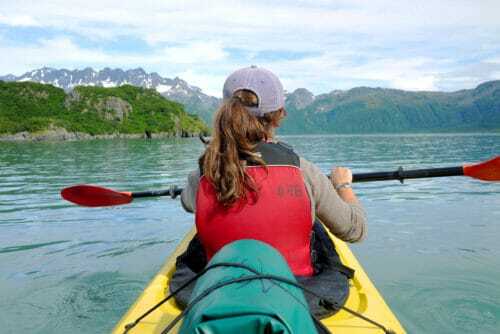 Travellers to Alaska are bombarded with opportunities to explore the amazing outdoors. 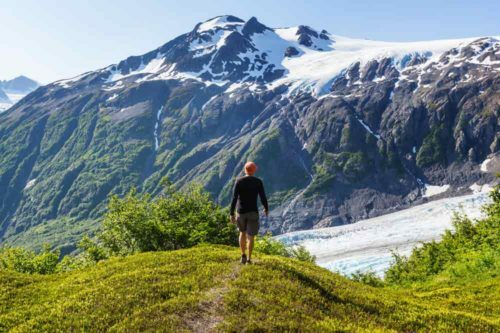 Fly over the mountain tops, go on an ice climbing trip, hike a glacier, kayak with Orca whales or adopt a Grizzly bear cub – Alaska has it all. Ok, not sure about adopting Grizzlies but I have seen all of the other options and so many more. 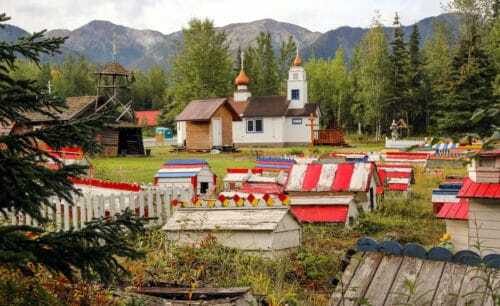 If you can budget a few hundreds of dollars a day per person, you’ll never be bored in Alaska. Guaranteed. Only we didn’t have that kind of budget. So, which amazing activity to choose? I was looking for a family-oriented experience that will offer a good “wow!” effect. Nothing too physically challenging. While ice climbing and heli skiing could appeal to some of us, there are those (ok, ok, me!) who are not as athletically inclined. We’re huge fans of National Parks, so it made sense to go with an activity that takes place in one. 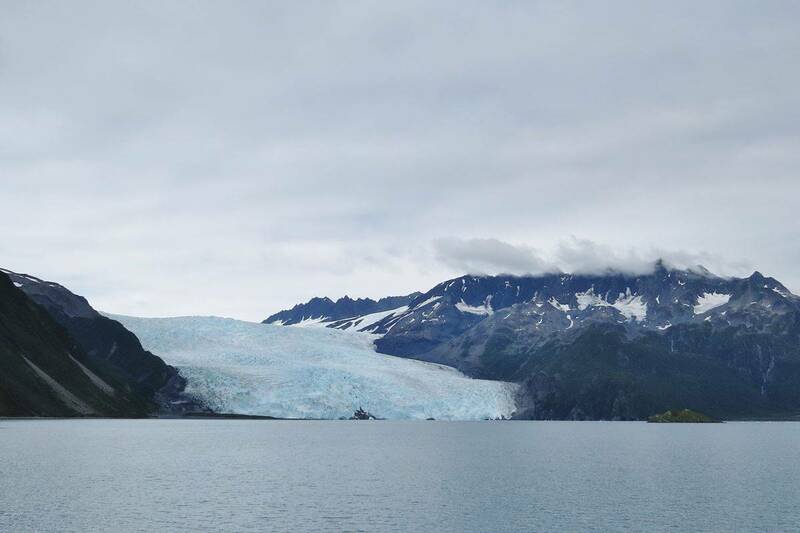 Since Seward, AK was included in our itinerary I decided to go with a glacier-viewing boat tour in Kenai Fjords National Park. 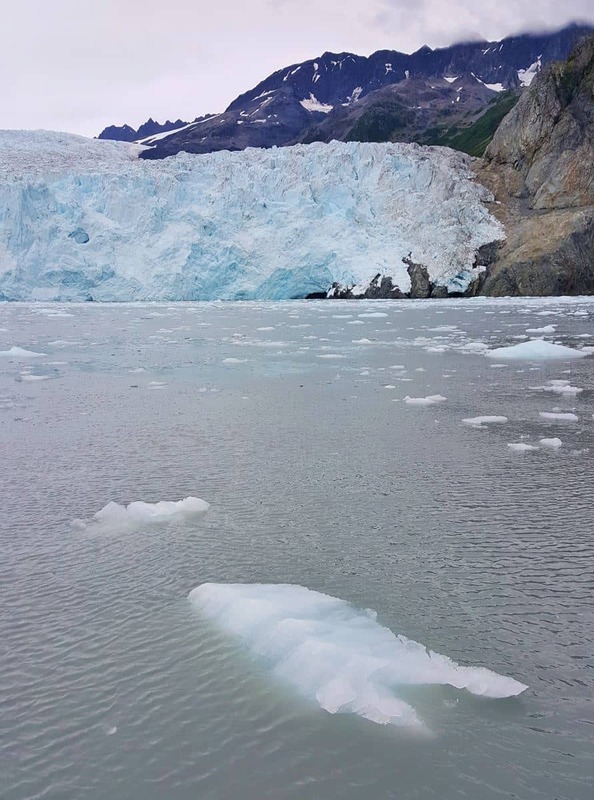 It promised great views, including possible ice calving in an active tidal water glacier. Calving, by the way, has nothing to do with cows giving birth. 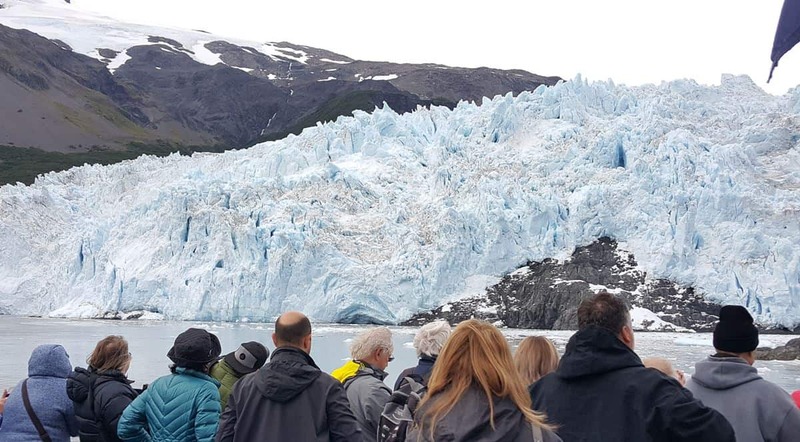 It’s that amazing phenomenon where a huge chunk of ice breaks off a glacier, sending a tidal wave that lifts and shakes a boat of shocked tourists who thought they were just there to take pictures. At least, that’s what Youtube videos show calving to be. Spoiler: We did see calving but our captain kept us at a safe distance so there were no tsunami effects at play. 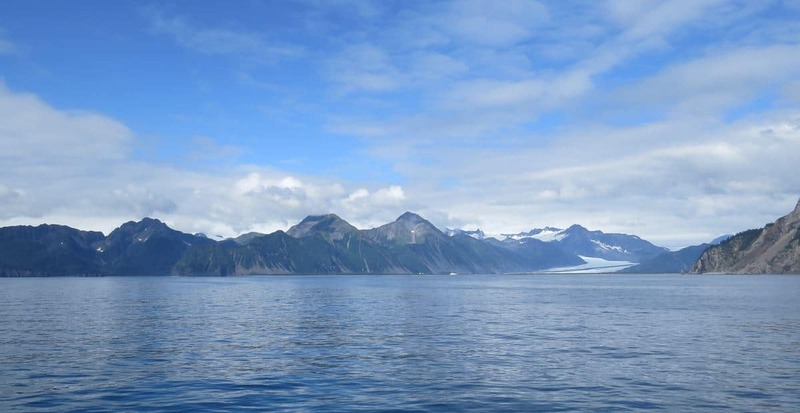 There are a few companies that offer boat tours of in the Kenai Fjords National Park. 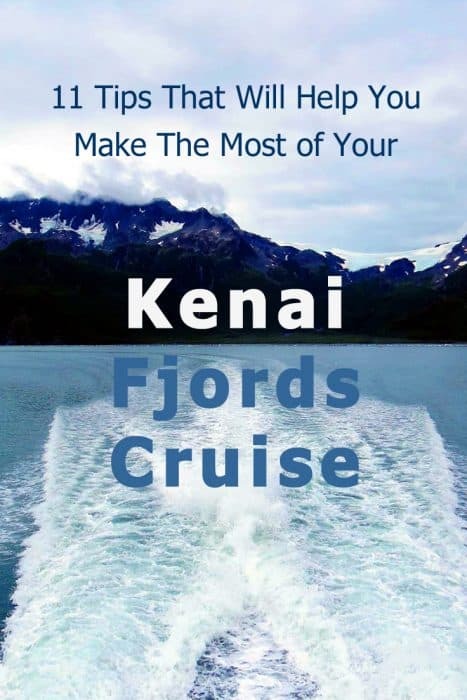 After reading descriptions and reviews, I decided on Major Marine Tours’ 6 hours long Kenai Fjords Cruise. The cost was $159.00 per person (our kids are no longer considered children). Fortunately for us, they were kind enough to offer us a blogger discount of 20% in return for an honest review of the trip. It still ended up being the most expensive day on our trip but I think it was well worth it! The cruise was leaving from Seward, a lovely town where we spent a total of three days and wish we had stayed for longer. 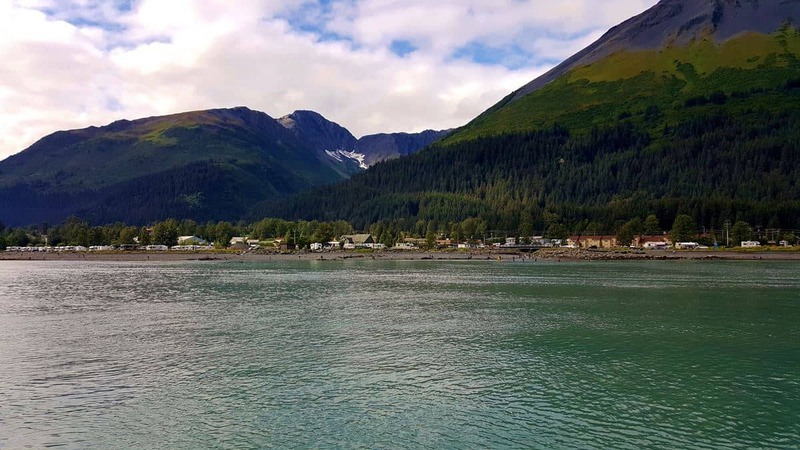 You can read here about all the wonderful things there are to do in Seward, Alaska. I booked the tour over the phone, just a few days before our arrival. I was hoping to have the weather forecast so I could make sure we were going out on the the best possible day. Alas, as we were getting closer to town, things looked gloomy. Seward was supposed to have rain, rain, and then more rain during all three days of our stay. So, I just went ahead and made reservations for one of the days – August 21st, a Monday. As it turns out, we were extremely lucky! It was raining during our entire stay in Seward, except on the day of the cruise! It was even rainier right after we left. We left our vehicle in the South Parking Lot of the harbor which was closer to the Major Marine Tours office. It doesn’t really matter if you park in the Southern or Northern parking lot. The southern one is closer to the office but the northern one is closer to the point of departure and return. Both are near where you need, so just pick either one. Major Marine Tours will refund your parking costs if you ask. I don’t recall anyone actually voluntarily telling us that but when we were walking out, I thought I’d ask and indeed, they were happy to give us $10 back. Cash and with no tiresome paperwork. It’s not a ticket validation system, just a friendly generous refund if you know to ask. 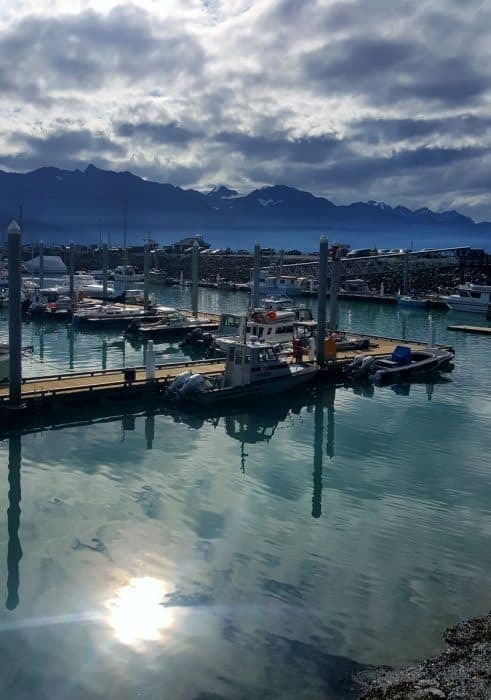 The Seward harbor is quite picturesque. 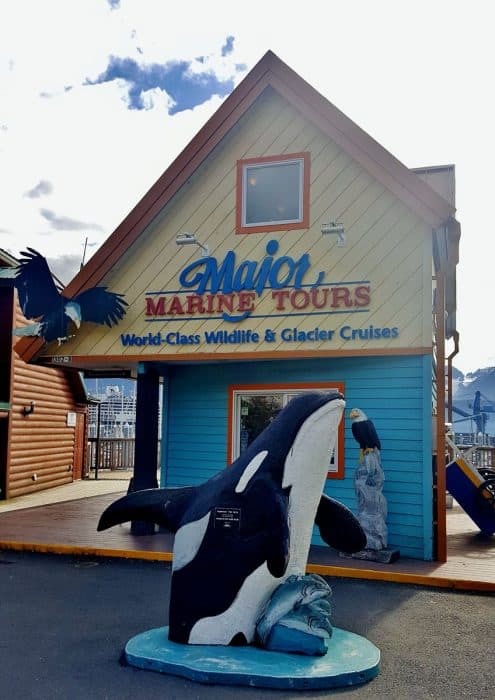 The Major Marine Tours office is located in a small colorful building, complete with its own Orca and bald eagles. Our cruise was scheduled for 11:30. We arrived half an hour earlier, as requested and check-in was super quick and efficient. No lines whatsoever. The nice people there just gave us our tickets and told us to walk over to the Harbor 360 hotel which was literally down the road. We could see our boat there – how exciting! You have seat reservations. There’s no need to stand in the line for half an hour until they start boarding the passengers. Just keep an eye on the line and join when it’s on the move. 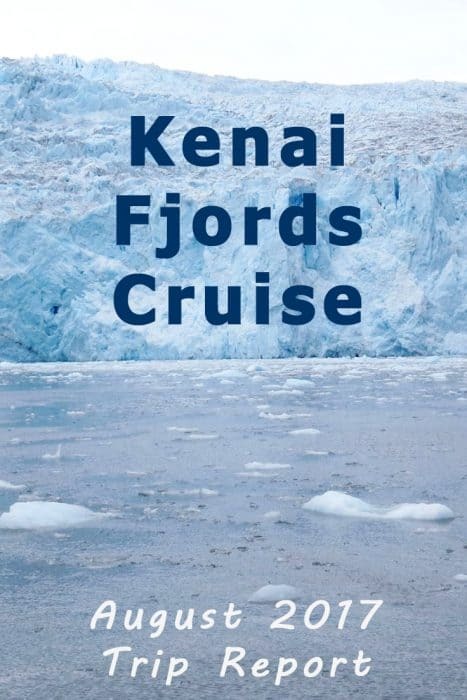 What to bring to a Kenai Fjords Cruise? Warm clothes including gloves/mittens and wooly hats for everyone. Our good camera (i.e. the “not-phone” one). Extra batteries for said camera and phones. A thermos with hot coffee. Did we really need to bring so much? In retrospect, we brought too much food and the coffee was redundant too. You can pre-order a meal for the cruise, which we did. We figured all that fresh sea air may call for more food and snacks. Don’t bring too much food, if at all. There’s plenty of food and drink on board the vessel. If you order the meal, you probably won’t need anything more. Bringing so many clothes proved to be a wise decision. It was quite cold out on the deck when the boat was going at full speed and/or getting near the glacier. We each had at least 3 layers on us, along with mittens and hats. Do bring extra warm clothes. You’ll need them at least during part of your journey. You’re not going to believe this but we actually brought our camera… without its memory card! They don’t sell any on board the boat but fortunately one of the crew members was kind enough to sell us one from his own personal phone! He deleted everything that was on it and we bought it. He said to just pay him whatever we thought it was worth and we gave him $50. A bit on the expensive side for just 32GB but it was entirely our choice and we were happy to pay extra as a token of our appreciation. Whew! Make sure you have batteries and memory cards and bring extras, just in case! With everyone seated, we could listen in on the mandatory safety lecture. It included one important warning: If you’re prone to seasickness, take a dramamine pill! I had experienced seasickness before but I figured the boat looked large and stable, so preferred to avoid the medication. Big mistake which I deeply regretted later on. Next, Captain Terry introduced himself and told us that this was his last trip for the season. He also introduced us to Ranger Lynn. They have a national parks ranger on board the boats which was one of the reasons I chose Major Marine Tours. 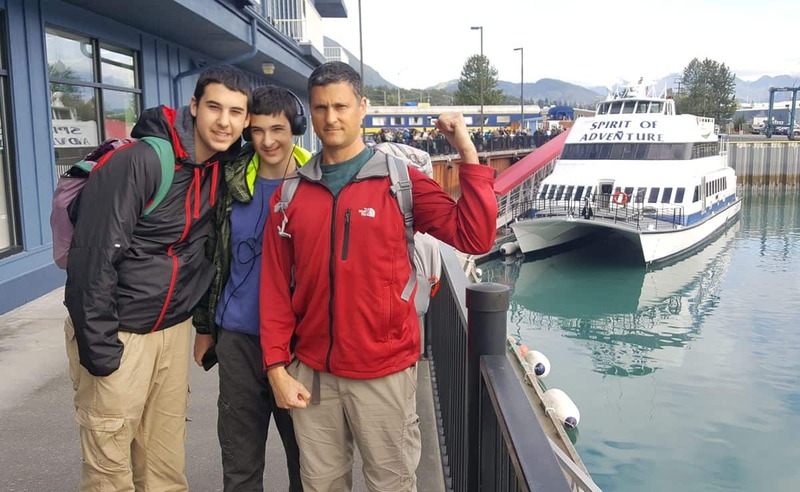 As the boat began to make its way out of the harbor, Ranger Lynn began to tell us about Kenai Fjords national park, its geology and wildlife. Did you know that otters have a lot of hair? In every single square inch of its skin, a sea otter has more hair than we do on our entire head! Three times more! Getting out on the deck! As soon as the ship sailed. I hoped to avoid seasickness by being in the open air and looking out on the horizon. The first part of the trip took us out of resurrection bay. It was smooth sailing and we got a good view of the southern parts of Seward. I was thrilled. No seasickness! Just a pleasant boat ride with good weather and wonderful views. Who could ask for more? Our destination was the Aialik Glacier, deep within Aialik Bay. 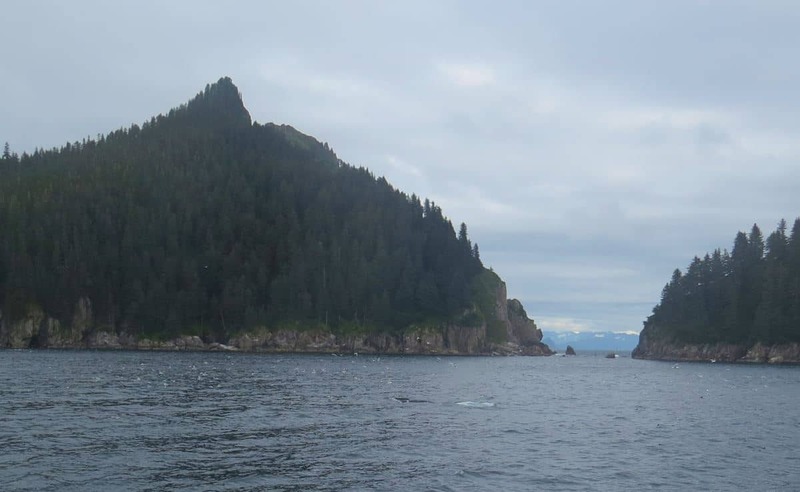 To get from Resurrection Bay -where Seaward is – to Aialik Bay, the boat has to go through open sea. And that made for a noticeable change. Captain Terry told us we were having it easy. With hardly any wind, the sea was anything but rough. We still had to cross through waves and yes, I became seasick. At first I tried staying out on the deck. The kids loved it out there and said it felt like a fun ride in an amusement park albeit a cold windy one. At some point, I decided to go inside and discovered the crew was passing sickness bags around. It was actually a relief to see I wasn’t the only one affected by the waves. I made it to our seats and tried to keep staring at the sea outside while holding a sickness bag close by. I’m happy to report that I never actually had to use it. As far as I could see, no one else did either. We made it to the peaceful waters of Aialik Bay in time. Once we were in calm waters, the boat slowed down and food service began. I was deep into my slow recovery process from being so seasick, so not really in the mood for any food. Fortunately, the meal was not rushed and I could nibble a few morsels of salmon about 20 minutes later. Service was fast and efficient. With food laid out in an attractive buffet, the crew called up table numbers, serving a limited time of tables at the time. This meant the line was always short. 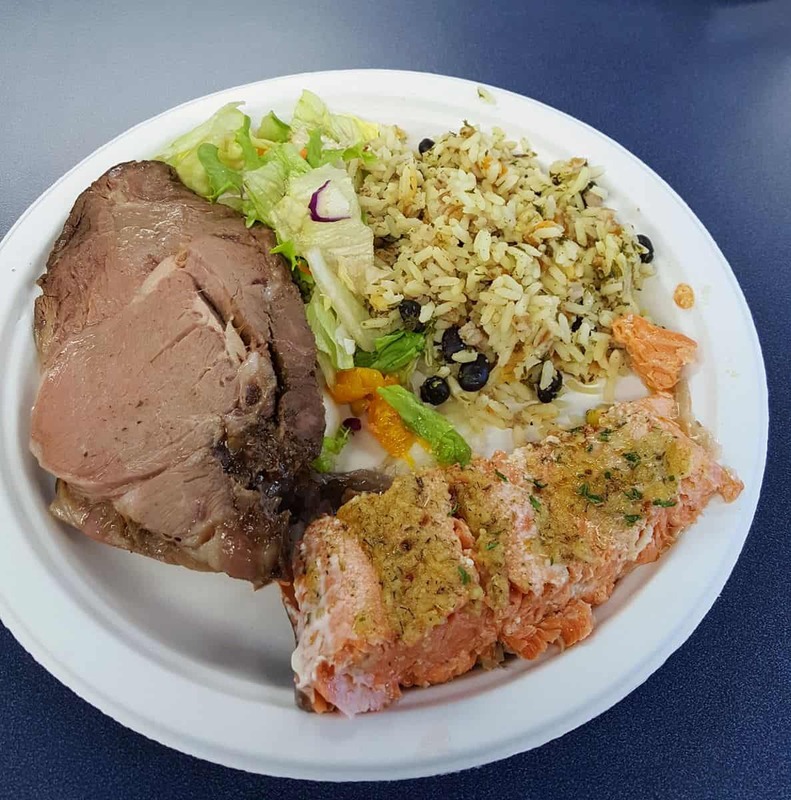 The meal included fresh local wild salmon, roast beef, seasoned rice and a garden salad. Everything was fresh and portions were generous, with seconds available once the initial round of service was over. It looks appetizing, doesn’t it? I was still somewhat seasick so focused on a few spoonfuls of rice and a nibble of salmon. Fortunately my husband made sure we didn’t have to throw away any food. 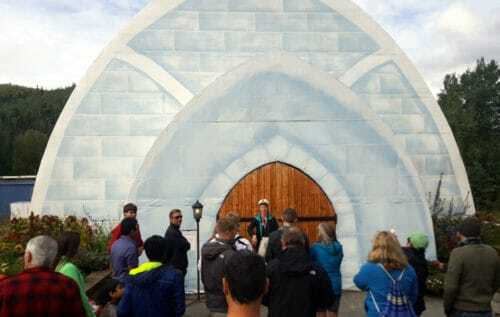 Finally – visiting Aialik Glacier! The boat was making its way deep into Aialik Bay during the meal service and we finally arrived at our destination: The magnificent Aialik glacier! This is one of the many glaciers that come out of the huge Harding Icefield, creating the Kenai Fjords. What you’re seeing is essentially a river of ice. Ice and packed snow flow – very slowly – from the immense icefield and out to sea. Aialik is an active tidal water glacier which means you can actually hear and see the ice being pushed out and falling into the water. 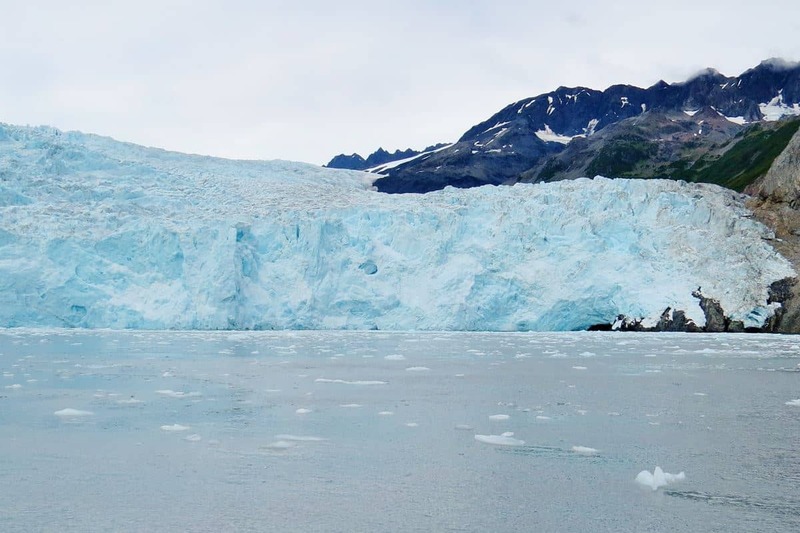 Captain Terry positioned the boat a quarter of a mile away from the glacier. The water around the boat were littered with chunks of ice, which was really cool. 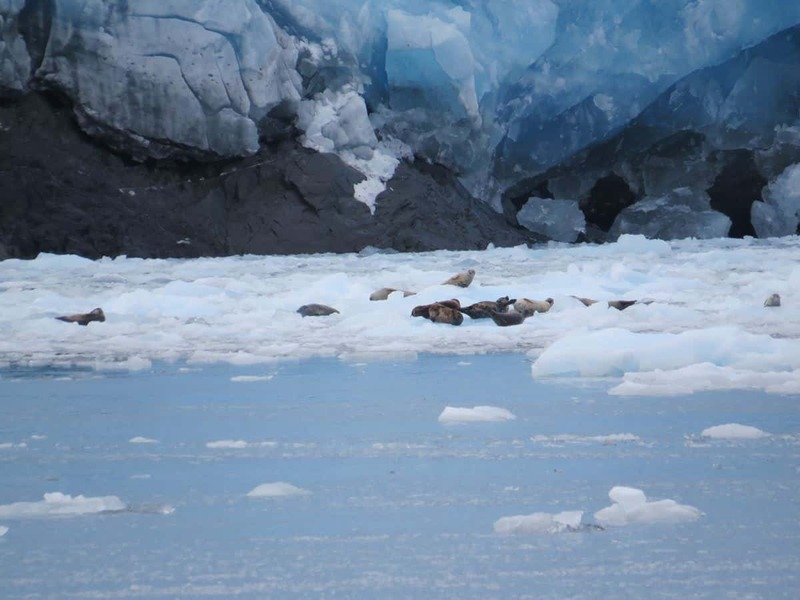 We didn’t realize how huge the glacier actually was until we zoomed in with the camera to see the seals lying on chunks of ice at the bottom of the glacier! Everyone got out to the decks to look and listen. Yes, listen. The glacier is quite noisy! Every few minutes we’d hear a thunder roaring as ice cracked and moved. 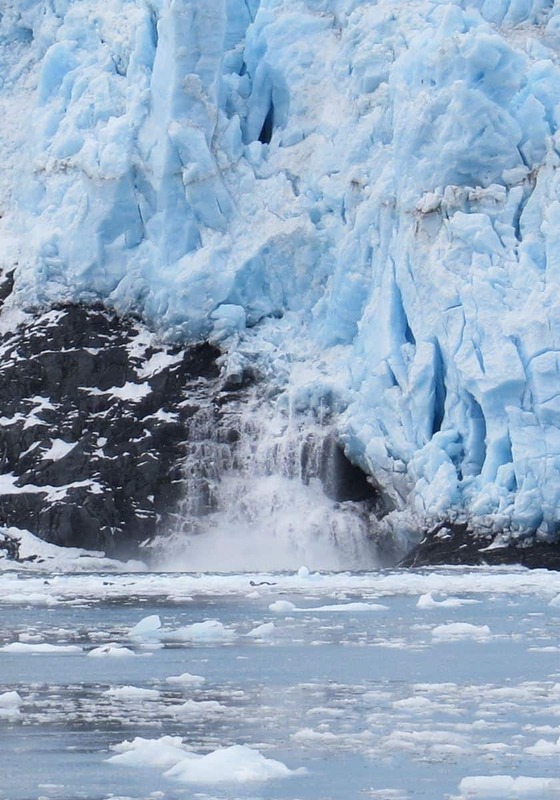 What you really want to catch is a good shot of a huge chunk of ice falling into the water. The larger the better. So, you hold your camera and try to cover as much ground as possible, hoping that you’re going to cover the right bit of ice when calving actually happens. And then it does. And it’s awesome. What a wonderful experience that was. Entirely mesmerizing. It seemed like only a couple of minutes went by when Captain Terry announced that we had literally spent half an hour watching ice melt. It was time to start making our way back. Whale Watching in Kenai Fjords National Park! When we started out, Captain Terry mentioned that this cruise was not a designated whale watching tour. Our destination was a tidal water glacier. Any wildlife sightings would be a welcome bonus and he would do his best to make sure we do see wildlife but no guarantees. That was fine by us. We had already been on three whale watching tours in the past, in Oregon, California and New Hampshire. They were all fun in their own way but we never saw actual full breaches – that stunning part where a whale jumps out of the water to show its entire body. Whales are seasonal creatures. If you want to see them jump out of the water, try to catch them in spring time during their mating season. August? Whales are busy feeding and you’re not likely to see more than a spout of water or perhaps the occasional fin coming out. And do you know what the funny part about that is? It’s still super exciting! There is something about being in the presence of these majestic marine mammals that just takes your breath away. Anyway, back to our Major Marine Tours cruise. Up until our return point from Aialik Bay we managed to view several cool animals. Sightings included seals, sea lions, puffins and a couple of sea otters. Not bad at all but not whales either. And then we saw Orca whales! Then on our way back, the magic happened. We were very lucky to catch Orcas so late in the season. 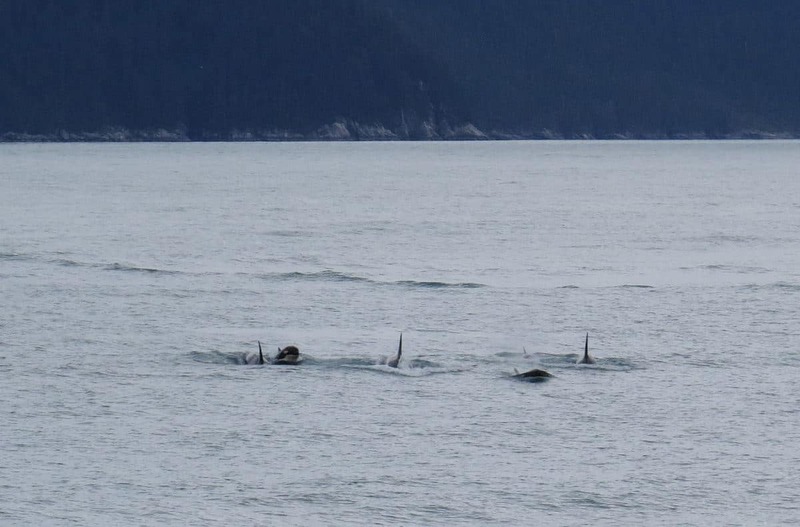 From what I’m told, they’re a common sighting in the Kenai Fjords during spring and early summer. Not so much in August and September. Don’t imagine SeaWorld’s Shamu making a full flip in the air. These Orcas were busy wild animals. 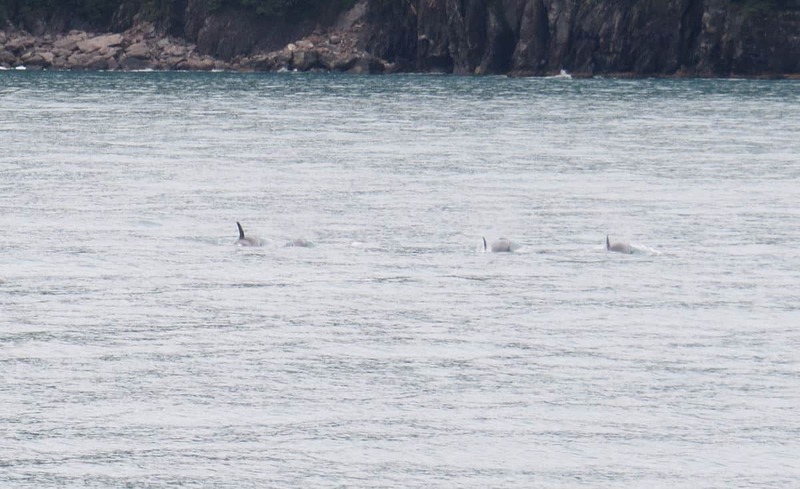 Our Captain spotted a pod of five (!) killer whales at the distance just cutting across the water towards us. And it was sheer magic. Everyone went quiet and we just focused gratefully on the amazing sight. I was getting goosebumps seeing them cut across the water like that. They then went under water and showed up again a couple of minutes later on the other side of the boat. I’m not sure why but seeing those Orcas was the most thrilling whale watching experience I have ever had. We continued on our way. Captain Terry had one more surprise up his sleeve! 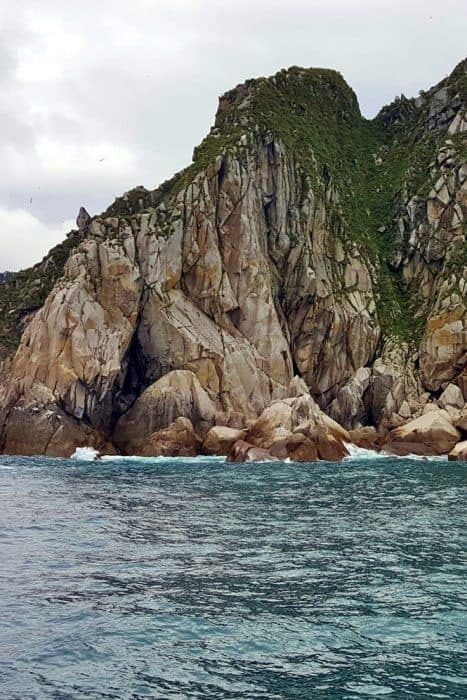 He took us to a beautiful spot between several small islands where humpback whales had been sighted feeding. Sure enough, they were there! Three huge whales! People were all over the decks, looking in all directions with shouts and calls all over the place as whales kept coming up to the surface at various points and then diving in again. Again, nothing more than spouts and fins but having so many whales doing that around us at the same time was pretty awesome. If the Orcas were my top whale watching experience, this one comes in as a close second. And this was not a whale watching tour! I can only imagine what an actual whale watching tour in this area would be like in spring time. From there it was smooth sailing all the way back home. Oh, and dessert! They served dessert on our way back to Seward. 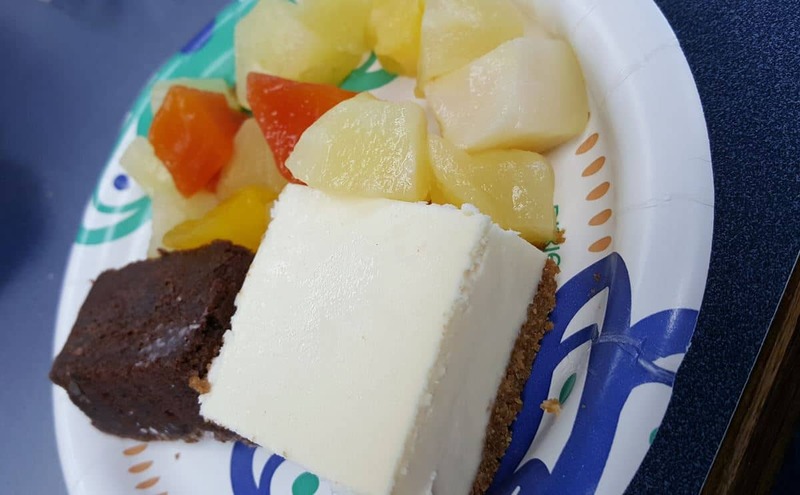 Yummy brownies, cheese cake and fruit salad. No longer seasick, I was able to enjoy dessert and help myself to seconds! I mentioned some tips along this post but wanted to put them all together – and a few others – in a single list, so here goes. Make reservations in advance. The weather can change and forecast isn’t always very reliable so don’t let that deter you from booking your trip. 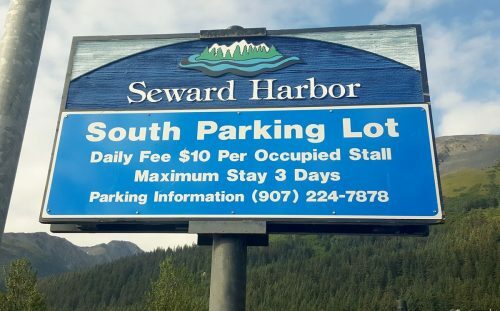 There’s plenty of parking space in the Seward Harbor parking lots. It’s only $10 for three days and Major Marine Tours will reimburse you for that. Your seats are reserved so no there’s need to stand in line prior to boarding. You can board the boat at leisure as long as you’re not late. Dress in layers and bring extra warm clothes. 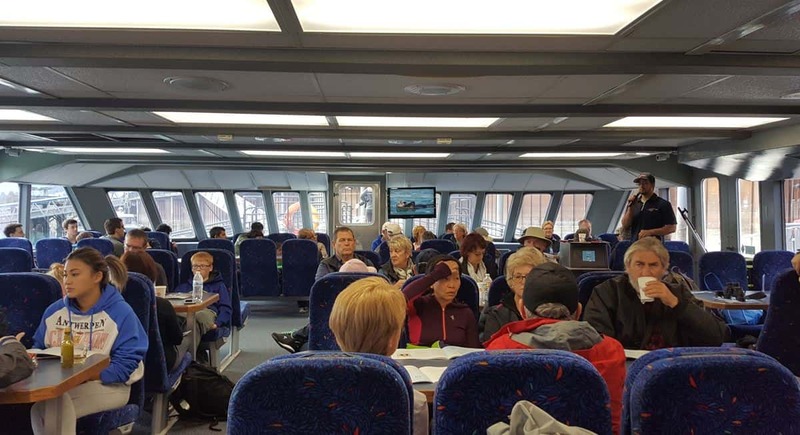 It’s nice and cosy inside the boat’s cabin but can be very cold on the decks when you’re near the glacier. Bring sunglasses. We had clouds for most of the day but when the sun was out, the glare from the water and the ice was significant. Bring extra batteries for your cameras and make sure you have enough room on your memory card – you will be taking lots of photos and movies! If you’re even slightly prone to seasickness, get the dramamine pill. Either buy your own at the pharmacy or buy one on board the boat. Follow the crew’s instructions on this. They know when to give out the pills with enough time for them to take effect. If you wait until the boat is out in open sea and you actually get seasick – it’s too late to take the pill. Order the meal. It’s worth the money and it will keep you full throughout your journey. Portions are generous and you can get second helpings. You won’t go hungry. Still worried about feeling peckish? You can bring your own snacks and food, not a problem. You can also buy snacks and hot dogs in the boat’s snack bar. Traveling with young kids? 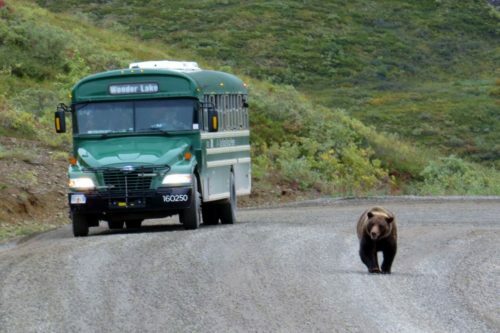 Have them participate in the Kenai Fjords National Park Junior Ranger program. We used to do that a lot when our kids were younger and it’s a great experience. With a ranger on board the boat, you can get the booklets, have the kids do some of the activities on the way and get the badge by the end of the trip. If you want to increase your chances of seeing whales, go early in the season. Keep in mind wildlife sightings are never guaranteed but in this area, in the right time of year, they’re almost as good as. That’s it! 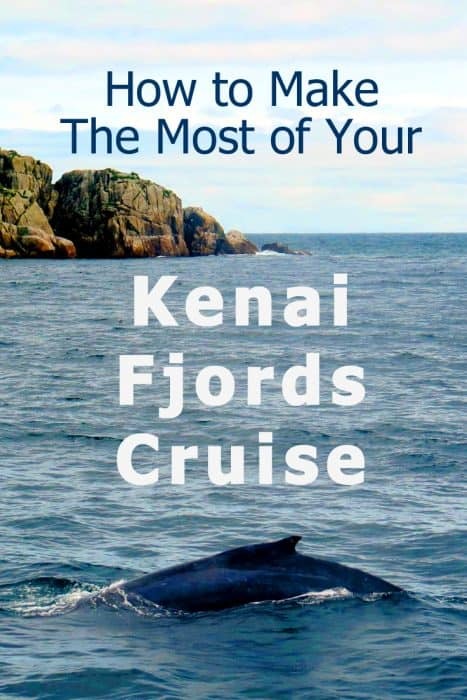 My long and detailed review of our Kenai Fjords National Park Cruise with Major Marine Tours. This was definitely one of the highlights of our trip and we had a great time. 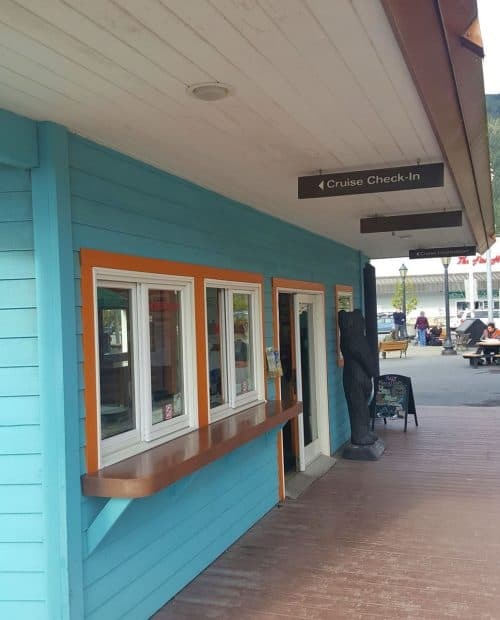 I hope my tips will help others make the most of their own Seward cruise. If you have any questions, add them in the comments and I’ll do my best to answer. Also, if you’ve been on a similar cruise yourself and can add your own tips and insights, that would be great too! 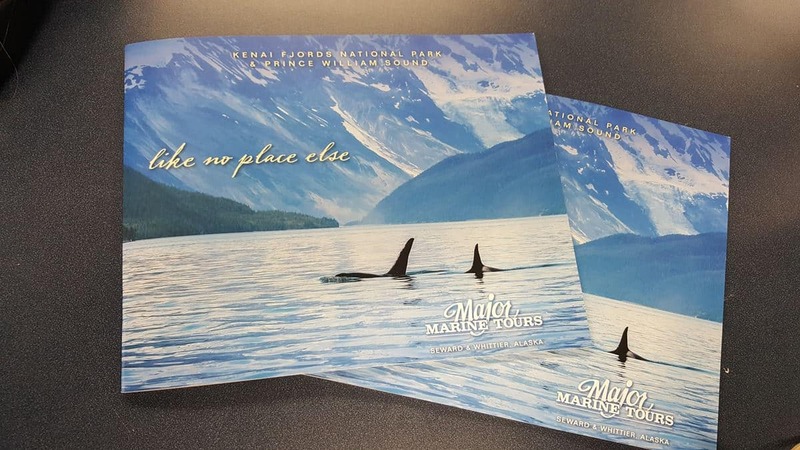 Looking for more things to do while in Alaska? 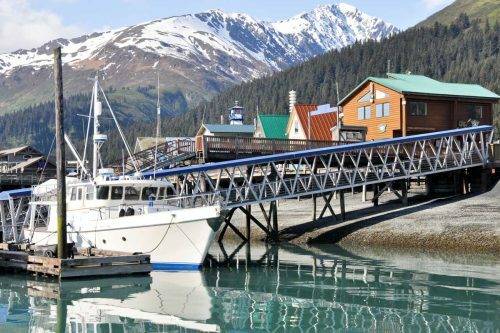 First, you have these 11 awesome things to do in Seward itself. 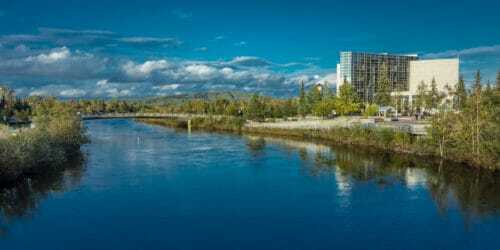 Then, check out my post about Alaska’s National Parks and also my Fairbanks activities guide and Anchorage activities guide. 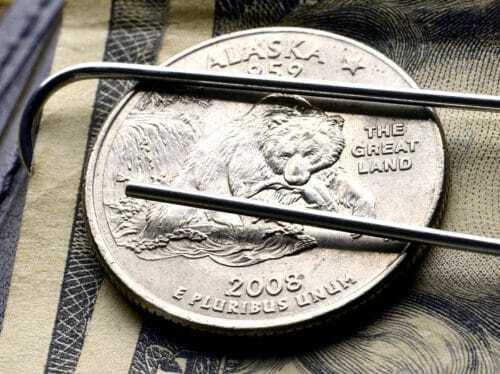 And don’t forget to use my 11 budgeting tips to help reduce the cost of your trip to Alaska! If you enjoyed this post, please do share it around! Here are a few more images you can use to share this on Pinterest – thank you! After reading you post regarding the cruise, I’m a little concerned about the sea sickness because I get extremely car sick. Thoughts? I would definitely take that anti-sickness pill they give you. On our cruise, they were selling them for $2 a piece at the beginning of the trip and I really regretted not taking one. I do think the trip is worth the risk, and hopefully mitigated by the pills, you’ll be able to enjoy it. Also, dress very warmly so you can sit outside in the fresh air. I had the worse of the sickness happen when I was inside. Thank you for sharing your experience! We are debating if we will take this or a similar tour from Seward in August 2018. I enjoyed your account and your photos and videos. It looks like a great tour! I’m going to go back and read your full Seward post. So glad this helped! Enjoy your cruise! I absolutely loved this. It felt like I was there with you. Your writing has gotten extremely good. Just wow. Thank you, Steve! Great to see you here again!